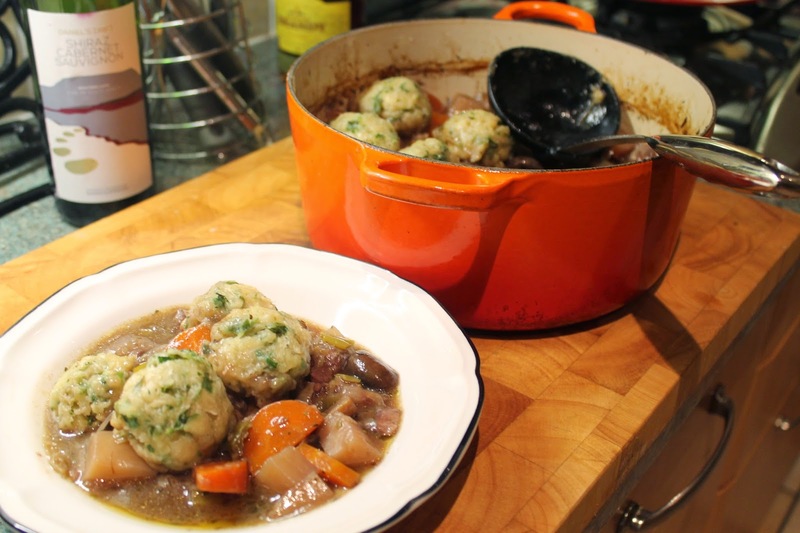 What food could be better for a cold, wintery evening than stew and dumplings? It’s the sort of food that gives you a cuddle, that doesn’t judge you for wanting to eat it in front of the X Factor in your pyjamas and odd socks. Although they take a long time, stews need very little effort – the oven does all of the work. 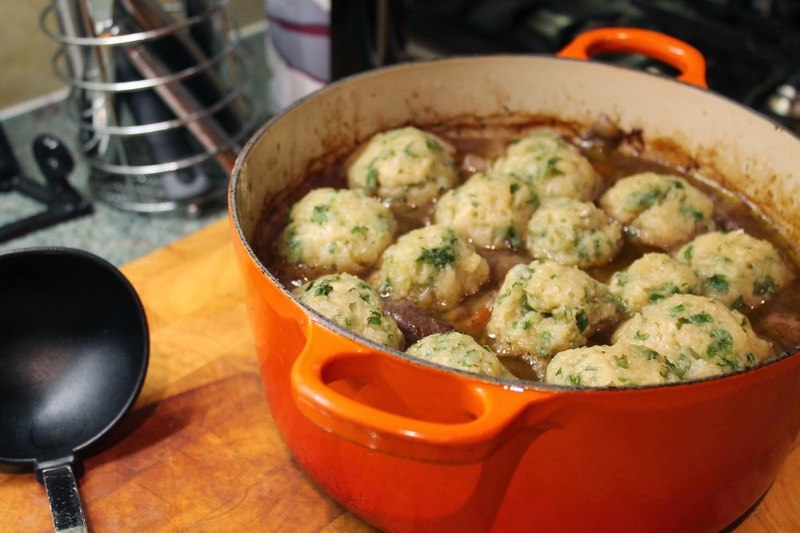 And though dumplings can seem a bit daunting if you haven’t made them before, they always work perfectly and are so worth the little bit of work required. You can add any other wintery vegetables you like to this stew – swede and parsnip would work well. This will take 3 hours in total to make, and will serve 4 hungry people. 1. Season the plain flour with salt and pepper and roll the steak in it, ensuring it is comppletely covered. 2. Melt the butter in a large casserole dish over a medium-high heat and add the steak. Brown lightly and then place in a bowl to one side. 3. Chop the onion and garlic and add to the casserole dish. Cook for 2 minutes, then put the steak back in and add the sliced carrots, sliced leek and chopped potato. Pour in the wine and add the mushrooms. Bring to the boil, then add the stock, rosemary, thyme and Lea & Perrins. 4. Bring to a simmer, then cover with a lid and place in the oven at 150 degrees. 5. For the dumpings, tip the self-raising flour, suet and parsley into a bowl. Season with salt and pepper. Add cold water a little at a time – you’ll probably need 150-200mls total – until it forms a pliable dough. 6. When the stew has been in the oven for 2 hours, take it out (leave the oven on). Form little balls (about 1.5 inches in diameter) with the dough and place evenly spaced on top of the stew. This mixture made 14 dumplings. 7. Put the lid back on and return to the oven for another 25 minutes. You won’t fail to enjoy this!